Carpet ripples, buckles and wrinkles? No problem! Capet cleaning and carpet restetching in just one appointment! Super convenient! 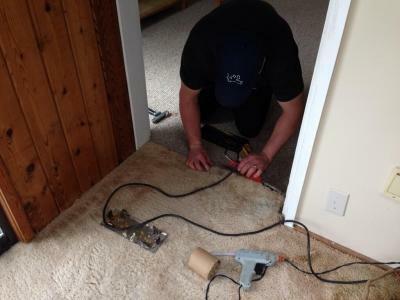 Victoria Carpet Care is happy to provide the best Carpet, Upholstery and Area Rug Cleaning Services to all of Greater Victoria, Sooke, Metchosin, Langford, Colwood, Saanich, View Royal, Esquimalt and Oak Bay. We are a family owned and operated local business who strive to provide the best service to ensure our clients are very happy! Victoria Carpet Care has a variety of different options to suit almost anyone's carpet and upholstery cleaning needs, including green cleaning options. The Carpet In Your home or building is a huge filter for Dirt, Pollen, Oil, Smoke, Dust, And So Much More. It needs to be emptied on a regular basis. A regular cleaning schedule will help insure that the carpet is clean and will improve the indoor air quality of your Home or Business TREMENDOUSLY! Hot water extraction system: A state of the art system that offers powerful and deep-down suction to remove dirt. Combined with our amazing cleaning products this allows us to clean your carpets in the most effective way to ensure your carpet will look like new once we've finished cleaning. This will ensure that your carpets and upholstery are always clean and you will benefit from the results of having great indoor air quality in your home. Request Your FREE Cleaning Evaluation Today!